We’ve been listening to your podcast and really appreciate the great information. We are working on our audience-facing mission statement, but we’re having a hard time understanding (lots of heated discussions with sales and product) how educating the audience without pitching the product will help us grow the business. Could you elaborate on that concept? During the interview, I gave one perspective on how to shift from promoting a product to marketing the education of your audience. But as this is a common question, I thought I’d share my answer and more ideas with you. If you only focus on pitching your product, you won’t be able to connect with people who are looking to solve challenges. By the time they know they need a solution, chances are they may have found an affinity for another brand which has answered their questions along the way. But, when content marketing is done well, it helps with everything from building brand awareness through sales to customer retention and up-sell. You, as a content marketer, can get much more than a sale. View Robert Rose’s recent video about the Strategic Content Marketing Spectrum in which he details the many benefits of content marketing apart from the sale. TRY THIS: Pretend you are a potential customer looking for answers to solutions that your product addresses. When you search, think about the words your customers would use to describe their pain, which very well may be different words than you use in your marketing. Does your competition appear in the results? Do you? Even when your prospects understand that they have a need and are looking for specific information, product pitches only take you so far. … I started a camera review blog that was my first commercial sort of blog and that had gotten to the point where it was full-time, but it wasn’t a very satisfying blog to write. My readers would come for one day to research a certain camera and then disappear and never come back. So I always had this dissatisfaction with it that I wasn’t actually building a community. I think that’s what really feeds me: Having ongoing readers. I always wanted a blog that was a bit more about helping people in a long-term way. As Darren discovered, features and benefits can be useful. When people are choosing between several options, having information about exactly what someone is getting is really helpful – and helps close business. But, that type of content doesn’t create long-lasting relationships or affinity for your brand. People make the purchase and don’t have a need to revisit your website. Aha. Darren now has created a loyal community of digital camera owners by educating them on how to use their cameras. The result is that they have a desire to continually return to the site – and Darren has multiple ways to monetize his audience. TRY THIS: If you are focused on pitching your product, what reasons do your potential customers have to come back? How can you engender trust so they become better customers? Many marketers couch the benefits of their products and services under the guise of “saving time and money.” While efficiencies are important, they often focus on what is good for the business in general. What about the person influencing or making the decision? What do they truly care about? Chances are that people want to feel secure in their recommendations and choices. The risk of making a bad decision can result in a ding against their career – or, in extreme cases, a lost job. If you teach people, you empower people. When you help them learn something, you help them feel like the smartest person in the room (or at the very least, competent as compared to their peers). A great example of a company that educates its customers instead of pitching them is John Deere, one of the companies profiled in CMI’s documentary, The Story of Content: Rise of the New Marketing. People know when they are being marketed to. The John Deere brand still stands for something. It stands for quality, it stands for honesty. That’s been a critical component of not just The Furrow’s (magazine) success but of John Deere’s success overall. TRY THIS: Look critically at your marketing through the eyes of your customer. Would you want to get a product pitch or do you want to be educated to be better informed or become more knowledgeable about the topic or challenge? Can We Please Stop Using Branded Content? During a recent coffee shop conversation, Chris Moritz shared an analogy I love: Content marketing is like your 401(k). When you get started, you invest but you don’t see a lot of immediate benefit. However, not only does your investment grow over time, it also compounds so you reap substantially more. 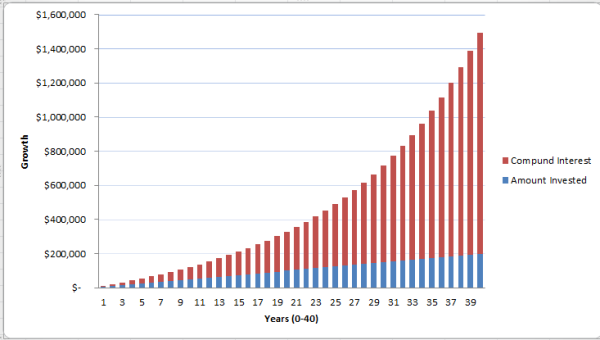 This chart shows the money you invest (blue) and how much that money grows over time because of compound interest (red). The same is true with content marketing. You invest now – with time, people, and resources – and you will continue to see the benefits grow exponentially. Most people who have been using content marketing already have examples of this – content created a while ago that still generates traffic, leads, etc. For anyone trying to get more from the content they create, content marketing can yield results for many years. For instance, when I was looking at year-end data for CMI, more than half of the top 30 posts were published in 2014 or earlier. That is a lot of traffic – and new email subscribers – from content we invested in years ago. TRY THIS: Calculate how much you are spending on marketing. Do you want this investment to help you years down the line or are you happy that it brings results more immediately and ephemerally? 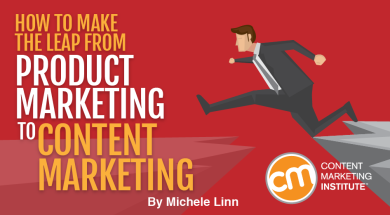 While content marketing focuses on truly educating your customers, there is a (small) place for product pitches within your overall marketing. There comes a point in the sales cycle where people truly want to understand your features and benefits – and how they stack up against your competition. If you can provide this information in a straightforward and genuine way, you’ll engender trust as well. Like many people, I get a lot of product pitches. By and large, many of them fall flat as they don’t directly tie to how I do my job. How can this product be used in my specific application – and how does it truly differ from other products out there? If you can frame your product pitches to answer specific questions, this can be a huge benefit to your customers as well. What do you think? Are you waging conversations for educational content? How are you convincing your management team? Want to expand this conversation to get buy-in (or a bigger commitment) from your C-suite? Check out our free Mastering The Buy-In Conversation on Content Marketing: The Essential Starter Kit. You also can show them the documentary, The Story of Content: Rise of the New Marketing.